Los Angeles City Councilmember Bernard C. Parks will celebrate his 50th year of public service on February 1, 2015. Parks is currently serving his third and final term as Councilmember for the 8th district, representing nearly 250,000 people. As Councilmember, he is a staunch advocate for holding elected officials accountable for their actions, promoting transparency, and assuring that government works for constituents. Parks was elected to City Council in 2003. During his first year in office, he was appointed Chair of the Budget and Finance Committee where he implemented prudent fiscal policies in tough financial times that steered the city clear of bankruptcy. 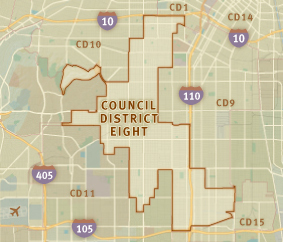 For six years in a row (2006-2012), Parks helped the 8th district to become the leading district in job creation. As Councilmember, he’s also very proud of the free and family-friendly legacy events he’s bought to the community including a Fourth of July fireworks show and concert, turkey giveaways, a winter wonderland and toy giveaway, and a 50-foot tree lighting ceremony. He’s backed a number of crucial measures and propositions including authoring Measure L, which passed by 63% of the vote and secured funding for library services, and supporting Measure R that funded the extension of the Metro Exposition Line and Crenshaw/LAX Project. Parks joined the Los Angeles Police Department (LAPD) in 1965, just as patrol cars were being integrated. He has served as a Police Officer, Sergeant, Lieutenant, Captain, Commander, Deputy Chief, Assistant Chief, and Chief with the force and is credited with creating the nation’s first Cold Case Unit in 2001 to close unsolved crimes and reforming one of the nation’s most renowned police forces. During his tenure with the LAPD, he was involved in some of the city’s most captivating events including the O.J. Simpson trial, the Rodney King incident and 1992 riots, and the Grim Sleeper serial killings. Parks has received countless awards and accolades throughout his career. In 1998, he was named as one of People Magazine’s, “50 Most Beautiful People” and was inducted into the International Civil Rights Walk of Fame in Atlanta in 2006. CBS 2 is scheduled to air a special on Councilmember Parks on Monday, February 2, 2015 during the 5 p.m. news broadcast.